One of my favourite podcasts these days is the Daily Bacon. I never thought I would warm to Richard Bacon when he took over from Simon Mayo in the BBC Radio FiveLive afternoon slot earlier this year, but the programme is great, and I rarely miss the podcast. Yesterday's featured Philip Pullman talking about his novel The Good Man Jesus and the Scoundrel Christ. It turns out that Pullman is surprisingly well informed about the Gospels and the interview is so interesting that it almost persuades me to read the book. At this stage it is only "almost", though. The podcast will be available to download for the next six days or so. [Subscribe to the Daily Bacon; Programme details]. Anthony Flew was one of the best-known atheists of his generation but he finally repudiated the label. As an academic philosopher he subjected the question of God’s existence to careful, non-polemical analysis. When he declared himself a theist in his old age he annoyed many of his admirers — which might have been the intention . . .
Update (15.28): The Telegraph also has its obituary of Anthony Flew tomorrow. As usual, it's nicely done. My only criticism is that they should put the scholars' names on screen the first time they appear. They are Anthony Thiselton, Alison Milbank, Emily Gathergood and I think Pete Watts. I uploaded the fourth and final episode of this week's back to back Passion Podcasts in the early hours of this morning. In this one, we turn to John's Gospel, NT Pod 33: The Passion of Jesus in John's Gospel. I have enjoyed this experiment in doing something a little different on the NT Pod, and to do something that is seasonal. I uploaded the third of this week's four Passion Podcasts early on Thursday morning. 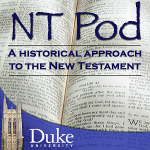 In this one, we turn to Luke's Gospel, NT Pod 32: The Passion of Jesus in Luke's Gospel. It is certainly my most ambitious plan so far on the NT Pod, but it's something I have enjoyed doing. I am pleased that the regular release schedule is not quite so demanding, though, and look forward to returning to normal again next week.